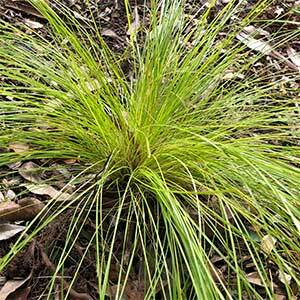 With very fine foliage, Lomandra affinis cylindrica is a tuft forming species the grows well is free draining soil. It is the very fine foliage that is the main attraction with one named variety called ‘Fibre Optics’. The attractiveness of the foliage makes this a great plant to grow in isolated clumps, it has a natural arching habit and this is the sort of position where it can be shown off to best effect. You could also grow this plant in a container in a courtyard if required. The flowers appear in summer, these are yellow and lightly scented. Look for the named variety ‘Lime Cascade’. With good drainage and a sunny position this is a very easy care plant. Plant in well drained soil, water in with a liquid seaweed fertiliser and keep the area around weed free by mulching. A little low phosphate native plant fertiliser in spring will keep the plant growing well. Position – Best in full sun to a little dappled shade. Height – To around .4 meter. Foliage – Lime green with very fine texture.